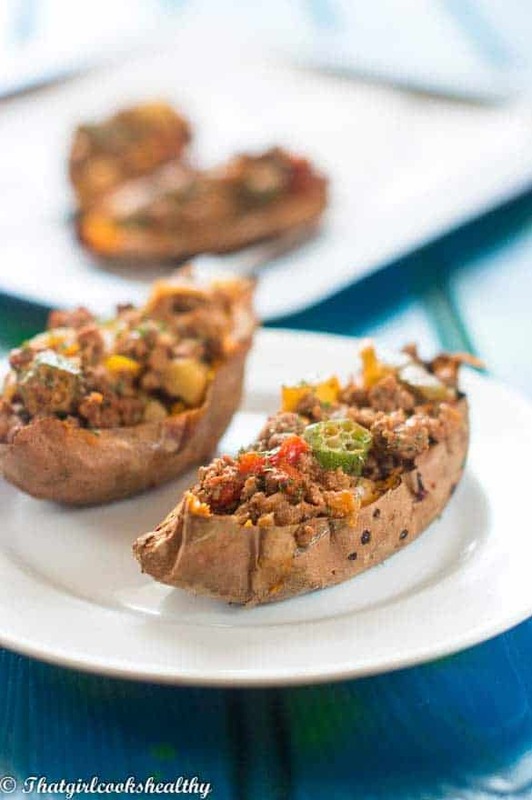 Loaded island style beef sweet potato skins – The perfect beef appetizer so good you can turn this into a main entree with extra vegetable. As of lately I’ve been consuming a large amount of beef and the reason for this is simply because my fitness regime has shifted into a more strength training direction. For optimal protein power I usually eat plenty of lean chicken breast and legumes but copious amounts of pulse and beans can leave me gassy. Ground beef is a great source of protein – the building block for muscle rejuvenation, that’s why so many powerlifters and body builders are in favour of lean beef preferably with a low percentage of fat. 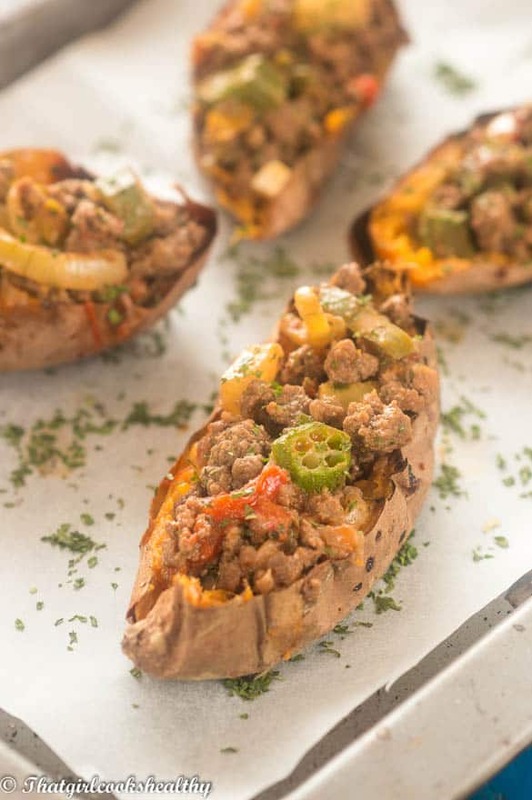 Don’t worry the entire content of this post won’t be speaking about fitness, I know many of my readers don’t care for that side of things and simply want to know how to make these loaded beef sweet potato skins. However I did want to highlight that despite beef containing some saturated fats (varies depending on where you purchase your meat from) is a great source of protein plus it’s low level of carbohydrates makes it an even more attractive option. Where possible I try to buy beef that has been grass fed and my reason for doing so is simply to ensure that the meat is pure and free from any growth hormones or antioxidants which can be typically found in grain feed cows held in a feedlot. This recipe has a slight island flare to it courtesy of the cho cho and okra – these vegetables are found in many Caribbean recipes including soup or a congealed cornmeal mix called cou cou/turn cornmeal depending on the island that you’re from. 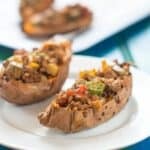 My homemade loaded beef sweet potato skins are ideal for those who are looking for a recipe to feed a large number of people for example a dinner party or if you’re content with doing a meal prep and don’t mind eating the same thing on rotation – a flavoursome stew that low fat, low carb and easy to prepare. The meat can be seasoned and left to marinate overnight though this is optional as I found adding the condiments and cooking up to a hour later still results in a tasteful stew and believe me I’m very mindful of ensuring that my meat is never bland. Can I use an alternative to cho cho (chayote)? If you don’t have access to cho cho which is also referred to a christophene, chayote or chow chow that’s fine, simply omit and replace with a zucchini instead as both of the vegetables derive from the same family and are water soluble. The sweet potato flesh once scooped out can be saved, frozen and used as mash on another occasion. Marinate the beef with the seasoning and set aside, if leaving overnight place in the refrigerator until the next day and follow the instructions below. 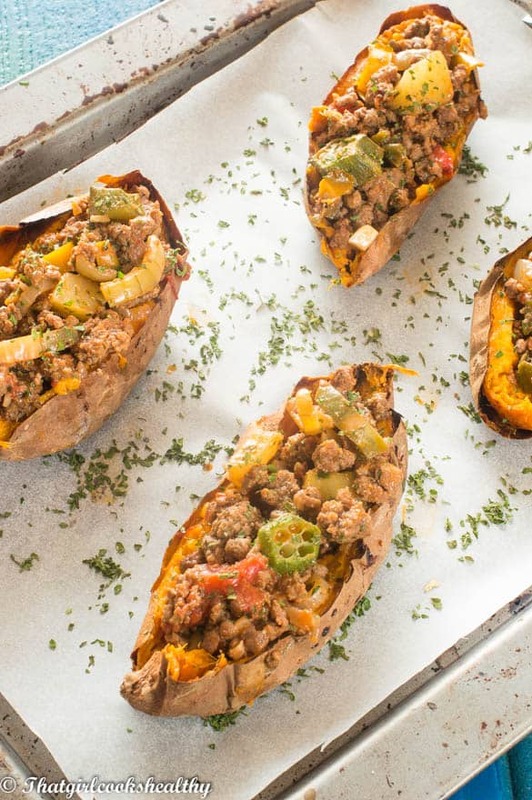 Place the sweet potatoes on a baking try lined with parchment paper and proceed to prick each one liberally with a fork. Remove from oven and allow to cool before cutting lengthways. Once the baked potato has been cut in half use a spoon to scoop out most of the flesh leaving 1/4 of flesh inside the skin. Save the flesh and make into mash (see recipe). As the onion and garlic begins to turn translucent add the ground beef. Sear and season the meat with the thyme, cumin, oregano, and parsley while continuing to stir the pan for roughly 10 minutes. You may notice an increase in oil from the beef which you can skim off before adding the tin of tomatoes. When the tomatoes have been added to the pan, bring to the boil before reducing the heat. Cover the pan with a lid and allow the stew to simmer for 25-20 minutes. 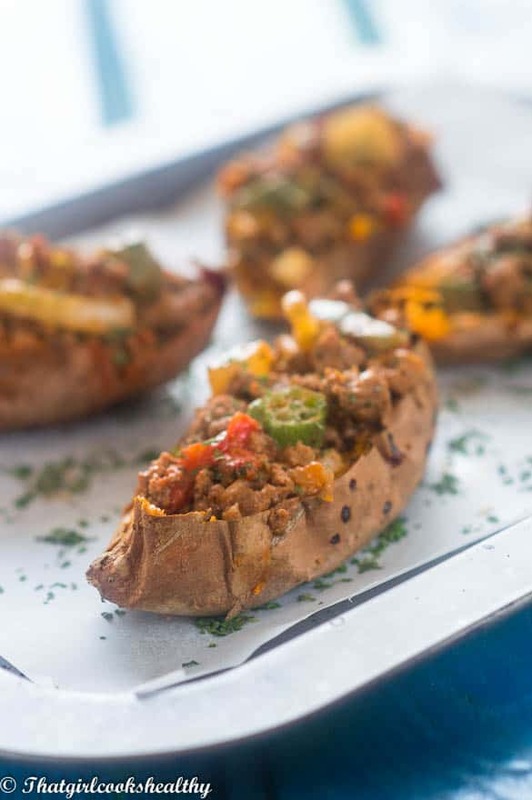 When the beef stew is cooked, prep the potatoes and heap a spoonful or two and load the potato skins.